It's beginning to look a lot like Christmas, everywhere I go.....Okay so maybe the 90 degree weather we just experienced has me longing for Christmas, it sure is looking like Christmas over at Artistic Outpost, with the release of Sleigh Ride. Don't you just LOVE this plate! This plate also coordinates nicely with last years Snowy Woods plate. Perfect for Home Decor pieces or your Holiday cards, Sleigh Ride features nostalgic images of children in their coats and finery, perfect for your winter or holiday projects. 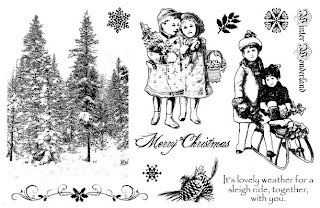 We also feature a versatile background stamp of glistening pine trees and holiday sentiments and collage elements. These stamps are available both as an unmounted sheet of red rubber measuring 8.5" x 5.5" or mounted on EZMount cling foam, pre-trimmed, and stored on a printed cling card. Visit the Sleigh Ride Gallery. Click here to save 10% on all your Artistic Outpost purchases. For this card I took my inspiration from Card Patterns Sketch 82, rotating the sketch to fit my image.﻿ The beautiful papers are from Cloud 9. I embossed the Artichoke panel to mimic the paper in the circle. The trees are stamped in Artichoke on Vanilla, then I sponged on some Distress ink in Pumice Stone. The image is stamped in Black Archival on Watercolor paper, colored with the Marker Watercolor Technique, then cut out with an Xacto Knife. (I did cut off the basket) The image is adhered to the stamped tree panel, so it looks like the image is Out of the Box. 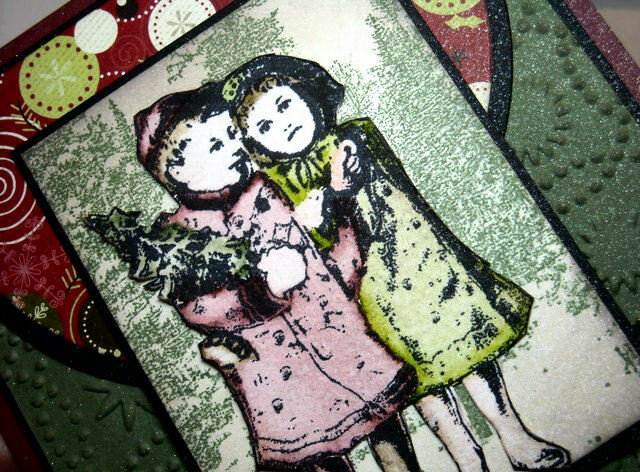 The close up at the top of my blog shows the Glimmer Mist, I sprayed over the finished card. I've had these beautiful snowflake frames in my alterable box for some time. I picked them up at Kohl's last year on clearance. I did a little masking with the Trees and Girls from Sleigh Ride plate, stamping the girls in Black Archival and coloring using the Marker Watercoloring Technique, then masking them and adding the beautiful Pine Trees in Pine Distress Ink. This makes for a quick gift or beautiful Home Decor piece. Wow- Gorgeous! I love the fabulous card you made and LOVE the ornament- Wow! The ornament is a great idea! Love this new set! Gorgeous projects! Love the snowflake frame with the image it is so beautiful. The papers and design on your card is wonderful! Great blog and terrific projects. You rocked these designs for Sleigh Ride release...The snowflake altered piece is just stunning. The soft watercolor effect is so perfect for these images ... gorgeous projects. Beautiful card and frame! 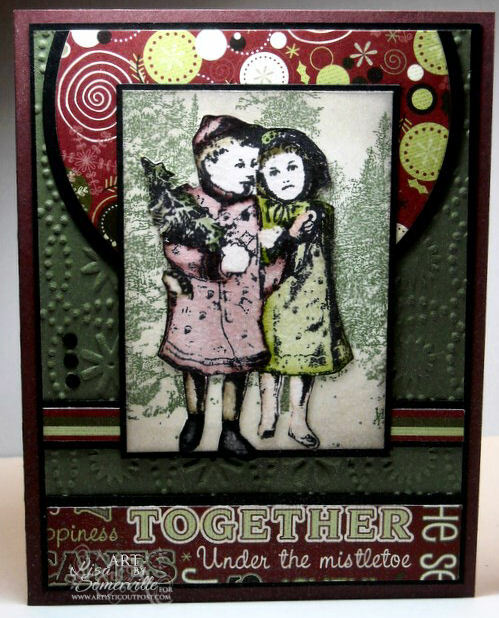 Luv the warm colors in the card and the sparkle in the snowflake frame is perfect for the image! Lisa, these are great! I love how you used the bold DP and yet the images stand out beautifully. Love the ornament too. Great idea. Both are beautiful! Brilliant use of that frame! It is still hitting 90 here, but dropping to the mid 50's at night! Have a great day! Beautiful images!! Georgous color combos on your creations. Lisa these are SENSATIONAL!! I really love this stamp set. I think it is my new favorite from there. And, they have so many good sets! I love how you put the trees around the children. The frame looks wonderful with that Vintage image in it! Delightful! Most EXCELLENT artwork! Quite festive! I have to have this set!! LOVE it!! the ornament is stunning! Love the papers on the card with that image, it's so pretty! Super projects, Lisa! I love that adorable image of the children on both! Wonderful dps and that embossing adds such fantastic dimension! Simply beautiful! What sweet images, loving the vintage feel to all of them. Your projects are perfect. Such pretty coloring, great images!! What a beautiful card Lisa! 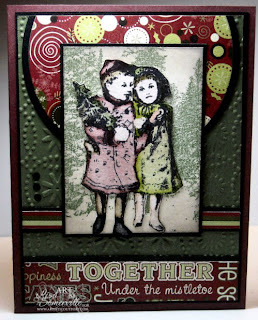 Love the stamping and the patterns.